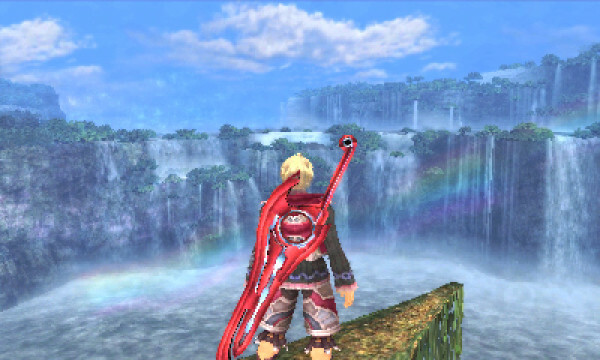 Xenoblade Chronicles 3D, simply put, is a beautiful mess. No matter how many times I try to formulate a different thought, I’m always dragged back to this centralized point. For every amazing backdrop and for every piece of gorgeous scenery, there are endless examples of how much Monster Games Inc. had to sacrifice to get this massive title running on the New Nintendo 3ds hardware. And yes, this game can only run on the N3ds system from Nintendo. Xenoblade Chronicles 3D is the first, hopefully of many, exclusive titles that are designed around the extra bump in hardware along with the extra buttons. Even with the more powerful hardware though, porting Xenoblade Chronicles to the N3ds was not an easy feat. The Nintendo Wii ran the game in 480p. A resolution that is already deemed pretty low by the fast-paced tech world. But now, the game had to be converted down to 240p which has led to a blurred graphical experience. Now, don’t get me wrong; Xenoblade Chronicles 3D is still a really damn good game, but it’s also a pretty messy port in many regards. At the end of the day though, Monster Games Inc. and Nintendo delivered a worthwhile experience to the N3ds, and have offered up a solid reason for purchasing the young redesign. Xenoblade Chronicles was heralded as the savior of the JRPG genre when it released back in 2010 (2012 for North America). The Japanese video game industry took a massive hit in quality during the 7th generation, and it seemed like many of the top Japanese game developers/publishers were lost and confused with the newer consoles. The previous two generations of consoles were dominated by Japanese content, and the localization process seemed to go pretty smoothly. Much has changed since then, and jrpgs in the West are now a rare occurrence. Especially those on a grand scale, which has led to so many people making these bold claims about Xenoblade Chronicles. By the time that Xenoblade Chronicles had finally released in North America on the Wii (even though it felt like Nintendo of America wanted nothing to do with it) I was already mentally finished with playing anything on the system. The controller was uncomfortable, especially the setup with the classic controller for games like Xenoblade Chronicles, and the resolution was so low that I could barely make anything out on my larger HDTV. Needless to say, I spent very little time with the original release of the game, and at one point I even expressed how much better it would be to play on the 3DS. Little did I know that several years later I would eventually receive my wish. I won’t go as far to say that Xenoblade Chronicles has saved the JRPG genre, mainly because Atlus has been holding things down for years. But I will say that it’s by far the best traditional JRPG I've played in the past several years. Outside of the incredible scenery, the other beautiful part about Xenoblade Chronicles is how true it remains to the JRPG experience. It takes what JRPG's have always done, maintains what makes them unique, and brings the experience to the modern style of gaming. Large explorable worlds can be accomplished much easier with the newer technology, and giving players the freedom to play the game how they want is a very popular idea these days. For some reason, jrpgs just never really attempted this concept. Xenoblade Chronicles is able to feel like a traditional jrpg with its cast, towns, quests, and story; but it’s also really great at taking the training wheels off and unleashing players into a massive quest filled environment. You always know where you need to go to progress the story, but there are always tons of quests that are there to pleasantly distract the player. Loot is also constantly being dropped which can make the item management in the game pretty fun. You’ll stumble across some new gear and then go down the line equipping better gear on your entire team. Although Xenoblade Chronicles 3D is a massive game, the teleporting system is there to make life so much easier for the player, and it also helps encourage exploration. Players will discover landmarks as they progress through the game, and at just about any point in the game you have the ability to teleport back to any landmark that was previously discovered. Considering that running around in the world can take up a ton of time, it was an intelligent design choice to allow players the freedom to teleport from area to area. 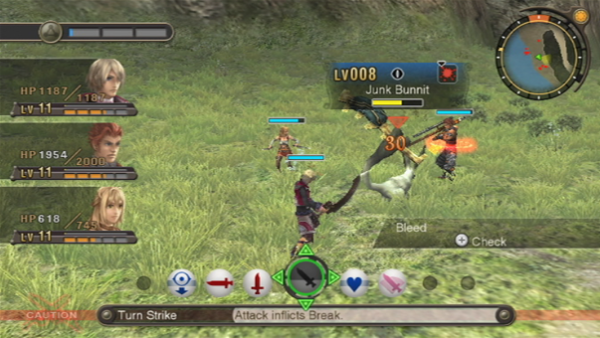 The battle system, although it isn’t perfect, is also another strong point for Xenoblade Chronicles 3D. Battles take place in real time and begin once you approach certain enemies, or if you begin attacking them first instead. Skills are centered on a bar on the bottom of the screen and are able to be selected once their respective cooldown finishes. Combat can take a bit of strategy because skills have specific effect, and the player must choose which skills to use when attacking from the back or side. An auto attack takes place in between skills, and chaining attacks can make all the difference when in a boss fight. Status effects like topple can be utilized when skills are chosen in the correct order. Knocking a tough enemy down for a few seconds can allow players to heal, and can also be a great time to rack up the damage. A downside to the interactive battle system is that the camera doesn’t autofocus on the action. On the plus side, this means that players can use the analog nub to do whatever they want with the camera during the action. A major downside to this though is that your right thumb is used to select attacks while also being used to move the camera. Sometimes the camera will lose focus on the battle at hand and you’ll have to sacrifice a couple of seconds of selecting skills just to be able to adjust the view. This is only a minor issue however, and doesn’t detract enough from the experience to really warrant not playing the game. Xenoblade Chronicles 3D takes a massive experience and brings it to Nintendo’s newest 3DS revision. It’s a little depressing that such a fantastic game, and the best traditional JRPG in years, has had such a niche audience. And I don’t mean niche in the sense that the actual market for the game is small. Because in all honesty, I think there is a huge amount of gamers out there that would have loved to experience this title, but the release consoles have just been so damn specific. While it’s awesome that Nintendo has this incredible IP, it really boils down to being a game that the Nintendo audience doesn’t really care for. Games like this on the Wii didn’t sell anything compared what Nintendo was able to do with Mario, and the majority of 3DS owners don’t have access to the title since it’s a N3DS exclusive. Still, Xenoblade Chronicles 3D is worth buying a new system for, and this is a must-have for longtime jrpg fans. Xenoblade Chronicles 2 is a rare behemoth of a JRPG on the Nintendo Switch. It's staggeringly content-rich. One could spend hours upon hours exploring the world of Alrest, challenging optional bosses, collecting rare BLADES (basically the game’s Pokémon) and scouring every nook and cranny for hidden treasures. The game also features an expansion pass with a promise of updating the already astounding game with even more content throughout the year 2018. The question is: is it worth your time? The Torna expansion doesn’t just offer a novel chapter to the Xenoblade Chronicles mythos, it presents an easy, digestible way for both newcomers and veterans to enter an engaging fantasy. But, like so many ambitious products, there are flaws: cliche characters, too many systems to manage, a diffuse main story, a grating and disjunct score, and most seriously a player character that essentially has no emotional impact. It is impossible not to admire and be impressed by Xenoblade Chronicles X, to not have many hours of fun with it, but it’s a hard game to love. Nintendo’s 3DS continues to build up a strong library of exclusives, and Kirby: Triple Deluxe adds another must-play title to that lineup. Although the controls are a little stiff, the new boss battles, multiple game modes, and the Hypernova ability all add to what makes Triple Deluxe a really fun game to play. Both newcomers and longtime Kirby fans will find a welcoming experience with his latest adventure.